At the other end of the meat case at H Mart where I found the oxtails was a lovely display of pig’s feet. If I’m going on a braising jag, I thought, I might as well go all the way. I had a recipe in mind, so I left with a bagful of animal extremities. Alluded to in the previous book, but not fully fledged, it now has a name and a place in every kitchen. This unctuous, giving gastronomic tool will become all chefs’ and cooks’ friend, finding untold uses in the kitchen. No fridge should be without its jar of Trotter Gear. 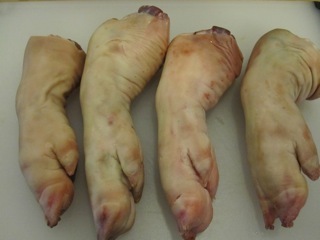 The recipe call for six trotters – just the feet – but I began with four feet that included the first joint as well, technically the trotters and hocks. 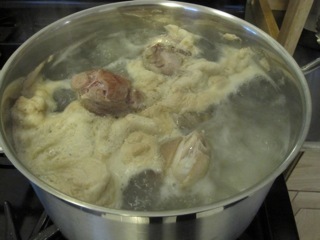 After familiarizing myself with porcine appendage anatomy by separating the feet from the hocks, I blanched them in boiling water for five minutes, then drained them to remove a considerable amount of scum that rose to the top. I returned the meat to the pot and added two onions, two leeks, two carrots, two celery stalks, a head of garlic, a thyme bundle, and a handful of peppercorns. 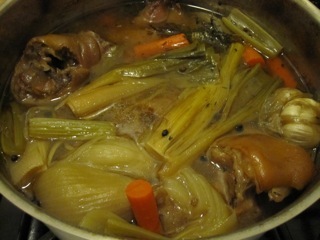 I followed the vegetables with half a bottle of Madeira and enough (homemade) chicken stock to cover. I brought the pot to a simmer. I removed the trotters from the pot and let them cool down, then strained the vegetables out of the cooking liquid and set it aside. 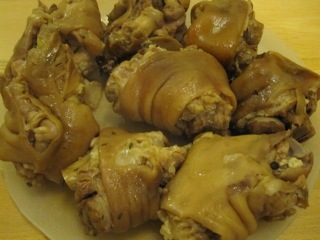 While they were still warm, I picked all of the meat, fat, and skin off the bones, tearing everything into small chunks. 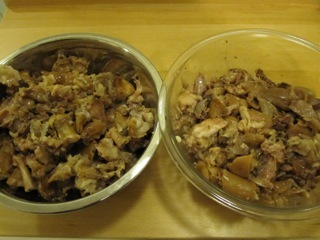 When I was done I had a bowl full of bones (left) anjd a bowl full of the good stuff (right). Although Henderson calls for mixing the meat back into the liquid and storing it in a jar in the fridge, I opted to portion the meat into plastic containers and cover it with the liquid. I cooled the containers down in the fridge before moving them to the Belm Research Kitchen Deep Storage Facility. You now have Trotter Gear, nuduals of giving, wobbly trotter captured in a splendid jelly. One can sense its potential even now. 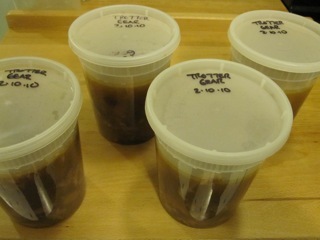 I’ve made TG, and filled my freezer with jars of the stuff. I haven’t really made any of the dishes from the books that call for it, so I can’t really speak for its usefulness, but the remaining stock is the best f’n pork glace evar. I couple of T added to soups, pasta sauces, greens, whatever, makes them sublimely good. Next time I make it, however, I’m going to use red or white wine rather than madiera, to give it a more neutral flavor. Oh, and on my way home from Italy in April, I have a 6h afternoon layover in London. Guess where I’m going. I expect to be adding the stuff to braises, but I also plan on making at least the pheasant pie recipe. The next batch will be made with white wine, for the same reason you state. I can only assume your layover will give you time to eat at St. John, the only question is whether it will be the main restaurant or St. John Bread and Wine. As it turns out, Smithfield is closed for some private party that afternoon, so Bread and Wine it is. I’m sure it will be good, but not the same, either. Not the same, but be sure to check the Menus page, it changes every day. Although they don’t have the bone marrow listed, I think you can ask for it. Nice post. I made a batch about a month ago, but like Andrew, I haven’t touched it since. @ Andrew, I’d suggest Bread and Wine anyway. Since you are eating alone it offers more “small plates” type of things. It is also just around the corner from a main train stop, easy access from Heathrow. 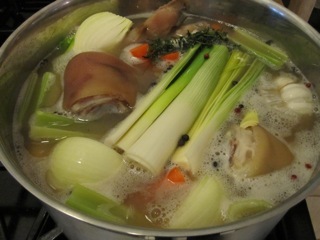 I plan on using it in one of Fergus’ pie recipes, and possibly to boost the braising liquid when I cook a pig’s head. It would also work as a base for gravy to serve with a pork roast. Pan drippings, totter gear – probably wouldn’t need any flour thickener. Naturally, I’m putting it to the test in the test kitchen, which also gives me the excuse to cook up a double batch of the stuff at work today. It’s a bit outré for our readership, but I’m going to do my best to get a Kitchen Note about it in the mag. If you don’t hear from Fergus, try contacting Thomas Blythe, the manager: thomas@stjohnrestaurant.co.uk. I think the fat content of the TG (and there’s a lot of fat) confers the “protective” benefits, not unlike the way you can hold cooked lobster in beurre monté. If that’s correct, the strained version should work just as well as the version with the meaty bits in it. I’m sure the gelaitin component makes a contribution as well. If you can get a Kitchen Note about TG into Cook’s you’ll be my hero. Thanks for the email tip. I sent it to kitchenSJ@stjohn.com, but I’ll try the manager too. Do you know him personally? As for the how/why question: if it is the fat and gelatin, it’s interesting, since it’s hard to think of another concoction that would have the same profile (other than another animal foot – one of my fellow t cooks used to work at Bouloud, where they made “calves trotter gear”, which was used in an almost identical way. The TG I made yesterday is ready to use, but I probably won’t have a chance to play with it until next week. I think I’m going to start by cooking a few recipes right from BNTT, including the Braised Squirrel (using a chicken squirrel), and Fried Rabbit (using a chicken rabbit). I’ll keep you posted. My fave side benefit of TG? The 16 quarts of extra stock it produces. That stuff is liquid gold. I don’t know Thomas personally, but he writes the Twitter posts for the restaurant. I corresponded with him when I was setting up my reservation last year. Let me know how the “squirrel” and “rabbit” turn out.